The Billy Bob instant smile teeth give you the look of having bright white, perfectly straight teeth. They can be used for completing a number of different costumes including prom royalty, Prince Charming, cheerleaders, and other flawless characters. 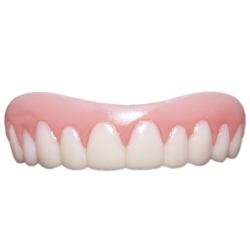 The Billy Bob instant smile teeth include one set of false teeth uppers and impression material that creates a custom, secure fit allowing you to comfortably wear them for extended periods of time.